Nowadays, the term Capo-di-Monte (with or without hyphens) is applied to a popular Italian style of porcelain items & decorative ceramics, characterized by their high-relief surface detailing. Colors are usually bright against a light background and the shapes are quite regular. Porcelain figurines in this style also abound and resemble the Meissen style. Most common themes are Neoclassical or Mythological motifs and encrusted Floral ensembles, collectively also inspired by the prevalent Renaissance spirit of the period it was first introduced. Portrayal of Puttiand Cherubs is a dominant feature of most examples. Highly ornate and impressive, they are very collectible and are primarily used for display, although several Capo-di-Monte ware is functional as in tableware & dinner service sets. Original maker's marks used by this company have been copied and imitated profusely, especially their Crowned N logo in countless formats or variations. Members of our Ceramics marks guides, will find all related logos or back-stamps used on Capo-di-Monte items for accurate identification, including both original and later copies or forged marks. Attributing Capo-di-Monte items correctly is also important in determining age as many 19th or early 20thC Capo-di-Monte issues are considered valuable and collectible in their own right, partly due to their age, but also because of their quality and immense beauty. Their aforementioned and famous Crowned N mark and the original Fleur de Lys impressed or hand-scribed marks have been mimicked extensively by many companies worldwide since the 18thC, including by many newer Art Ceramics studios in Italy, who often use the original name of Capo-di-Monte in some sort of adaptation, and of course on recent imports from the Far East. Items with the original genuine Capo di Monte marks are EXTREMELY rare. 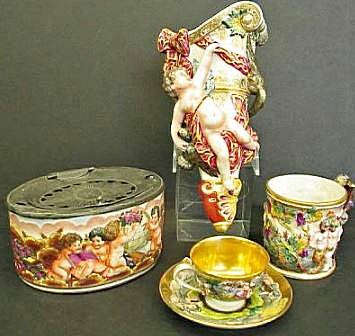 However, antique or vintage specimens in that style, for example those made by Ginori or companies in Germany, France and elsewhere by reputable porcelain factories, and which are by far the most commonly encountered models in today's antique fairs or through dealers, are of exceptional quality and very desirable with collectors. These fetch consistently high prices at auction and sell quickly. For newer examples, condition and decorative value have the greatest impact on pricing. Below are some examples from our Pricing Guides database. Four Capo-di-Monte Figures. Marked to base. A 'Capo-di-monte' wall plaque of Madonna & child. A pair of 'Capo-di-Monte' bisque figures (2).